While this site began as a testament to the design and engineering success of Kodak (US) in the 1930s and 40s, in the process of doing research about Kodak rollfilm cameras, I discovered the Kodak Regents, two cameras that were designed and manufactured by Kodak's German organization. Kodak had divisions in both Great Britain, beginning in 1889, and Germany from 1931, when it aquired Dr Nagel-Werke. Dr August Nagel was a talented and ambitious camera designer, who started supplying cameras in 1908. By the 1920s he had formed the Contessa-Nettel AG company, but economic stagation of that decade resulted in mergers that produced Zeiss Ikon AG, a company in which he was only a player. In 1928, he formed his own company, Dr Nagel-Werke to manufacture upscale cameras and in 1931, he sold that company to Kodak, who financed the development of the Retina, a precision 35mm camera, priced well below Leica's and Contaxes. As rollfilm began to replace plates and sheet film, Dr Nagel developed German versions of some cameras released in the US and some cameras that were unique to Germany. A hallmark of cameras from Kodak AG was the elongated, octagonal body. It was a surprise then, when in 1935, Kodak AG introduced a sleek Deco-styled folder called the Regent, particularly since, at the same time, it introduced the Regent II in the familiar Nagel octagonal shape. While the latter model was superior functionally and ergonomically, the Regent succeeds as an incredibly elegant design. Closed, nothing protrudes from the camera's simple envelope but the handle and a bit of the recessed winding knob. There is only the smallest trace of lens bulge on the front, the rear of the popup viewfinder in the closed position assumes the cross-section of the camera top. While it is not smaller than the contemporary 620 Vollenda from the Nagel factory, it seems more compact because of its sleekness. The separate superimposed rangefinder is designed into the top of the camera and is evident only two two small circular windows on the front and one on the back. Closed, the camera measures 6 1/2 inches (165mm) long, 1 5/8 (37mm) thick and 3 7/8 (98mm) wide. It makes a 6x9 cm or 6x4.5 cm image, and among several Kodak folders to offer such a favorable camera size-to-image size. 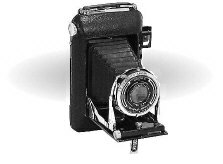 Both Regents offered a feature--a rangefinder--that had appeared on only one other Kodak rollfilm camera--a model of the Autographic--and that Kodak included on only a few other later rollfilm cameras. Rangefinders made their debuts the 1916 Autographic 3A and became more common in the mid-1930s on rollfilm cameras and, since these cameras had relatively long normal lenses, the rangefinder was an imporant addition. Both Zeiss and Voitländer introduced rangefinders on their top models and Kodak kept pace with their top Nagels. Unlike most of the American Kodaks of this period, the Nagels used superimposed rangefinders. Thel original Regent suffers poor design tradeoffs. A separate viewfinder allows the option of a magnified viewfinder that can be more accurate and visible; yet, here the separate rangefinder's superimposed design results in a dim rangefinder viewing window set 2 1/2 inches from the viewfinder window. I can say from use and maintenance of the Regent that its rangefinder is rather dark and the linkage is rather frail. The Regent II combined the rangefinder and viewfinder into a single viewing window to realize the benefits of a superimposed design. While I haven't used a Regent II, based on use of a Nagel Duo with Rangefinder, built about the same time, I would expect the Regent II's combined rangefinder/viewfinder to be rather dim and uninspiring, but these were early days in closed viewfinder design and the Nagels were about average.